Notes: With fall upon us I’ve taken it upon myself to do some research and reviews on Pumpkin beers. 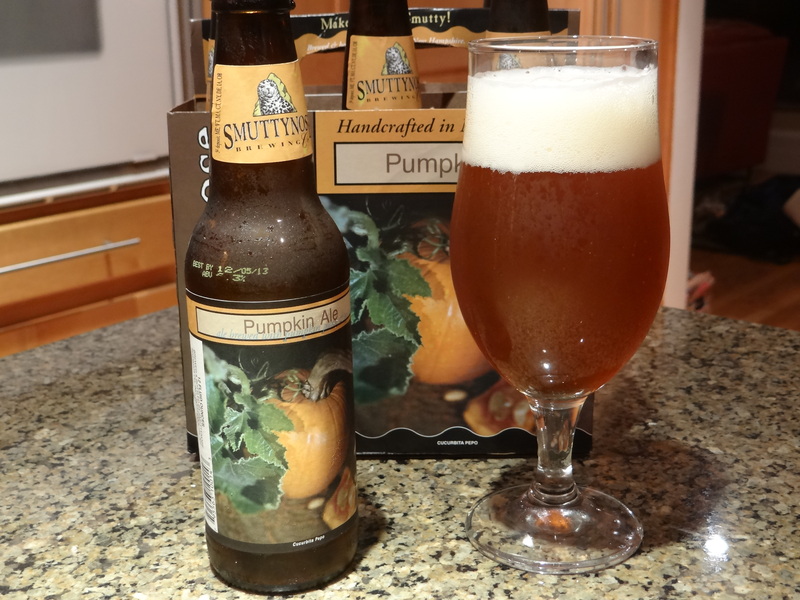 Some were already on my radar, but some only surfaced after reading Gary Dzen’s piece on the best pumpkin beers of 2013 (see post in Opinions, Surveys and Taste Tests). This first review, on Smuttynose Pumpkin Ale, falls into the latter category. In that review Dzen says it has a complex taste and likens it to a Pumpkin Saison. I’m a big fan of Saisons so I had to give this beer a try. Plus at $8.49 per 6 pack it is cheaper than a lot of craft beers out there, so I don’t have too much skin in the game. This beer has a definite orange hue topped by two fingers of pure white head, which makes it look vaguely like pumpkin pie with a dollop of whip cream. It’s not particularly aromatic but what you can smell is the pumpkin pie type spices (cinnamon, nutmeg, allspice) that are ubiquitous in pumpkin beers. At this point I’m expecting a pretty typical pumpkin beer, but I was in for a pleasant surprise when it hit my tongue. The pumpkin and spices are there, but they are matched by a pretty healthy dose of spicy hops. The mouthfeel is nice and creamy with a dry finish. The pumpkin-hop combination works surprisingly well with the hops taking the sweetness out, a fatal flaw in many pumpkin beers. I would say that Dzen’s description as a Pumpkin Saison is only half-right. It does have the black pepper spiciness of a Saison, but none of the Brett yeast flavors that I think of with a good Saison. Nonetheless, it is a very solid beer. If you are looking for a good pale ale with pumpkin and spice accents this is a beer for you. If you are looking for something that screams pumpkin pie, look elsewhere.